Bringing authentic flavors and ingredients from the Mediterranean to Philadelphia. The stunning restaurant, which is the first of its kind in the city, will transport guests to the Greek Islands with an atmosphere reminiscent of an inviting Mediterranean home and a menu of authentic specialties, simply prepared, that represent the best of Greek cuisine. The restaurant specializes in whole grilled fish, served by the pound, which is flown in from the Greek islands, the shores of Morocco, Tunisia and Portugal and procured from independent North American fishermen. Guests are able to choose their own fresh fish from the restaurant's expansive displays, and watch chefs cook it to perfection over a charcoal grill in the sparkling open kitchen. We have created a welcoming restaurant designed with the comforts of a typical Greek home. We used materials such as hand-chiseled Jerusalem limestone floors, hand woven rugs, vaulted ceilings, antiqued stucco walls, wood plank floors and exposed wood beams to evoke the traditional atmosphere. A series of dining areas with arched entranceways feature large rustic farm tables, dark wood chairs with white cushions and dining nooks with upholstered banquettes. Downstairs, Estia houses three private dining rooms, one resembling a walk-in wine cellar with domed stone ceilings. Wine displays and barrels cover the walls. 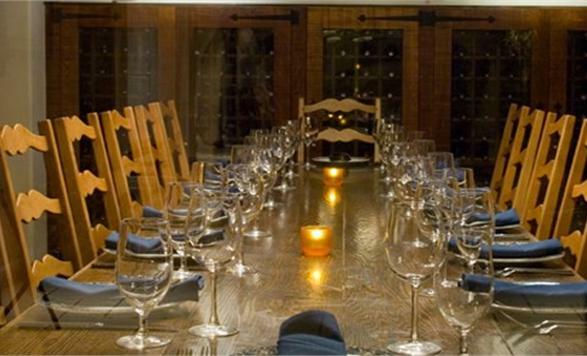 The wine room can accommodate up to sixteen guests, and two of the private rooms can be combined for large parties and banquets. Estia is located at 1405-1407 Locust Street across the street from the Academy of Music. The restaurant is open seven days a week for lunch, dinner and pre-theater meals. For more information, please call 215.735.7700.